ONIONS are Texas' leading vegetable crop. Onion sales bring the state between $70 and $100 million per year and the onion industry has an overall impact of about $350 million per year on the Texas economy. Most of the sweet yellow onions, which people all over the world enjoy because you can "eat them like an apple", can trace their origin to the Lone Star state. The sweet onions from Texas started when the Bermuda onion was introduced into South Texas in 1898 when a packet of onion seed was planted near Cotulla. The onions were shipped in 1899 to Milwaukee, Wisconsin, where they were so enthusiastically received that a larger acreage was planted. By 1904, approximately 500 acres of Bermuda onions were planted in South Texas. In spring, 1907, 1,011 carloads of onions were shipped from South and Southwest Texas; in 1908, production had more than doubled, and in 1909, 12 counties shipped 2,920 carloads. Shipments reached 6,735 carloads in 1917; this figure was not exceeded until 1928 and 1929 when the total movements were 7,055 and 7,232 carloads, respectively. The largest movement in 50 years for a single season was 10,164 carloads in 1946. The Canary Islands, principally Teneriffe Island, produced most of the onion seed planted in Texas until about 1946. The two types of Bermuda onions generally grown in Texas were the Yellow Bermuda and White Bermuda and Crystal Wax. As the acreage of Bermuda onions in Texas increased, the Canary Island growers became overtaxed to meet the demand for seed and after 1920 the declining quality of Island seed was noticeable. There was an increased mixing of strains and varieties, probably because new and inexperienced growers were entering the seed business and the better growers could not find sufficient isolation for their seed fields. The increase in bolting and splits and doubles caused the per-acre yield of U.S. No. 1 onions to become so low that South Texas growers seriously considered changing from the Island-grown Bermuda seed to the Babosa, or Grano varieties, which were imported originally from Spain in 1925. To develop varieties better adapted to South Texas, the Winter Garden station of the Texas Agricultural Experiment Station inaugurated an onion-breeding program in 1933. The program was expanded considerably in 1939 with the establishment of a cooperative breeding program by the U. S. Department of Agriculture and the Texas Agricultural Experiment Station. The breeding work was again expanded in 1946 when breeding lines, experimental varieties and hybrids were planted cooperatively in growers' fields throughout South Texas. "Horticulturists of the Texas Agricultural Experiment Station (Crystal City, Texas) used crossing techniques to improve tomatoes, cantaloupes, and strawberries. Our main crop, onions, are not easy to cross since they have large flower heads, so we didn't attempt much in onion breeding. We had good relations with Dr. Fabian Garcia, Director of the New Mexico Agricultural Experiment Station, and he had obtained a high yielding variety from Spain from which he had selected a strain for New Mexico he named Grano (Babosa). We tried this and when our grower neighbors saw the trial, they ordered all the seed available. In 1938, the Byrd Cattle company at Winter Haven, Texas had 10 to 15 acres of the Grano. This variety required a longer day to form bulbs and was 10 to 14 days later than Bermuda. This is a market disadvantage which tended to offset the much higher yield." "We also had good relations with Dr. Henry A. Jones, onion breeder for the U.S. Department of Agriculture. He advised us that earliness in onions is a recessive character and will reproduce in successive generations. Mr. Leslie R. Hawthorn, vegetable specialist at the Winter Garden Station, obtained permission from the Byrd Cattle Company to harvest all the early maturing bulbs on a certain date. He and his assistant, Oneal Blackard, spent one day harvesting all the bulbs that had matured in the whole field. This amounted to 4 or 5 bushels which were then stored in our station barn. Temperatures were high that summer, so many of them rotted, more than half. They were then sent to Greeley, Colorado, for increasing the seed." Early Grano (Babosa). The bulbs are top shaped and have very few thin to medium-thick pale-yellow scales. The flesh is soft and very mild in flavor. Early Grano is somewhat resistant to thrips, but very susceptible to pink root fungus. The variety bolts much less readily than Yellow Bermuda and Crystal Wax in Texas when planted at the same time. It is a heavy yielder in the absence of pink root. Matures later in South Texas areas than the Yellow Bermuda. The Early Grano onion was imported originally from Valencia, Spain, in 1925 under the name Valencia Grano 9452. As indicated by Ernest Mortensen, the New Mexico Agricultural Experiment Station grew seed from the original lot and made selections. The name Early Grano was proposed for the selected strain in 1931 in bulletin 193 of the New Mexico Experiment Station. Excel (986) is a single-plant selection from Yellow Bermuda that was developed and introduced in 1945 cooperatively by the USDA and the Texas Agricultural Experiment Station. Texas Early Grano 502. Characteristics of Texas Early Grano 502 are similar to those of Early Grano except that it is more uniform and matures much earlier. The tops are not as heavy as those of Early Grano and the foliage is more upright. The bulbs are broader and not so pointed at the root end as those of Early Grano. Like other strains of Early Grano, it is very susceptible to pink root. However, on good soil where pink root is not a factor, it will produce tremendous yields. Early Grano matures along with Excel in south Texas. A selection out of Early Grano was released by the Texas Station as Texas Grano in 1944. (1) An earlier selection with small upright tops was released in 1947 as Texas Early Grano 502 to replace the original release. Yellow Bermuda. Bulbs are flat with very few thin, shiny, pale-yellow scales that are soon broken and lost in handling. The flesh is soft and mild in flavor. The bulbs reach a diameter of 3 to 3 1/2 inches when grown under irrigation. The Bermuda onion with pale-yellow skins was first listed by Peter Henderson &;Co. in 1888 as White Bermuda. D. Landreth &;Co. for 1890 says that although shipped as White Bermuda it really "had quite a yellowish character" and, although known as a product of Bermuda, is of Italian origin. The F1 Hybrid Named Granex (later to be claimed as Vidalia) Released Before 1960 -- One Of The Most Famous Onions In The World! Granex. A yellow, F1 (first-generation), Bermuda-type hybrid. Bulbs are intermediate in shape between Bermuda and Grano. Resistance to pink root is intermediate between the two parents. This hybrid is very mild in flavor, which makes it a good salad onion. Early Grano is 3 to 5 days earlier than Excel. Granex, developed cooperatively by the USDA and the Texas Station, was released in 1952. The female or seed parent was developed from Excel and is similar to Excel except that it is male - sterile. The pollen parent, Texas Early Grano 951, is an inbred out of Texas Early Grano 502 (2). Texas Grano 1015Y is an improved selection from 951. According to Paul Leeper, "the Granex was the first F-1 hybrid developed for commercial production and used male sterility in producing the hybrid. A and B lines of Excel are crossed to maintain the male sterile Excel A line which is then Crossed with the C line of Texas Early Grano 951 to produce seed of Granex. This procedure must be completed each year to produce the true F-1 Hybrid Granex. (This procedure is explained in the USDA Yearbook of Agriculture for 1950 and also in "Onions and Their Allies" by Henry Jones and L. Mann.)" Texas-bred Granex has been popularized worldwide under many different names. One such onion is the Vidalia. Vidalias were first grown in Toombs County, Georgia when a farmer named Mose Coleman discovered that the onions he had planted were not hot, as expected. They were sweet! The first Granex onions grown in the Vidalia, Georgia area were grown from transplants. The reason behind this was because at first herbicides were not available to control weeds and the weeds would grow faster than the onions. "In 1952 Granex transplants from Dixondale Farms (Carrizo Springs, Texas) were first shipped to Georgia," said Wallace Martin, President of Dixondale Farms. Yellow Bermuda transplants were shipped in the '40's. The greatest quantity of Granex transplants shipped to Georgia by Dixondale Farms was 17 18,000 crates in 1981. Early Jordan of Griffin &;Brand took the first truckload of transplants (Yellow Bermuda) from Earl McClenson to Vidalia in 1944. Before that several crates were shipped by Rail Express. The Granex Y-33 (Asgrow Seed Company) was the most commonly produced transplant. It was a struggle to sell the onions at first, but Coleman persevered, and managed to sell them for $3.50 per 50-pound bag, which in those days was a big price. Other farmers, who through the Depression years hadn't been able to get a fair price for their produce, thought Coleman had found a gold mine! They began to follow suit, and soon after, their farms were also producing the sweet, mild onion. The State of Georgia built a Farmers' Market in Vidalia, and because the small town was at the juncture of some of South Georgia's most widely traveled highways, the market had a thriving tourist business. Word began to spread about "those Vidalia onions." Consumers, then, gave the onions their famous name. Vidalia Onions have developed an international reputation as the "world's sweetest onion." Their mild flavor is claimed to be due to the unique combination of soils and climate found in the 20-county production area. "Vidalia onions" began appearing on the shelves of Piggly Wiggly and A&P;grocery stores. Through the 1950s and 60s, production grew at a slow but steady pace, reaching some 600 total acres by the mid 1970s. At this point, a push was made for Vidalia onions to be distributed throughout the nation, and several promotional efforts were begun. Onion festivals became an annual event in both Vidalia and nearby Glennville, Georgia, and production grew tenfold over the next decade. Approximately 225 growers cultivate Vidalia onions on over 14,000 acres. About 125 handlers are involved in the grading, packing and distribution of Vidalias. An average of 300 50-pound bags of Vidalias are produced per acre. Approximately 6% of the 275 growers cultivate 100 acres or more; 7% produce on 50 to 100 acres; 40% on 10 to 15 acres; and 47 % on 10 or fewer acres. The majority of Vidalia onion farms are multi-generational, family owned-and-operated businesses. The industry's annual Vidalia onion harvest brings some $50 million directly into Georgia's economy. The economic impact from related downstream marketing activities is estimated at $145- $150 million. Vidalia onions are sold loose by the pound, in 2-, 3- and 5-pound "pre-packs," and in 10-, 25- and 50-pound mesh bags and boxes. Generally recognized Vidalia onion sizes are small (1 to 2 1/4 inches), medium (2 to 3 inches), and jumbo (over 3 inches). Obviously, the Texas-bred Granex has been popularized worldwide under many different names and produced tremendous economic advantages wherever it is used. "While Henry Jones was with the University of California, he discovered cytoplasmatic male sterility in a variety of onion called "Red Italian". He and others at the University developed a system for maintaining this male sterile line which was called the "A-line and which was homozygous male sterile for both of the genes carried in the nucleus and male sterile for the S-gene which was carried in the cytoplasm. They also found maintainer or restorer lines called B-lines which were male sterile in the nucleus but had a F-gene in the cytoplasm. When the B-line which is self-fertile is used to pollinate the A-line so little cytoplasm is carried in the pollen to the A-line that it does not make the seed of the A-line fertile and all flowers produced from the resulting seed are therefore sterile. Any number of lines can be crossed on to this male sterile line to produce any number of hybrids and these lines are called C-lines. In developing C-lines, selections are made from open pollinated varieties. These selections are grown in cages and self-pollinated by using flies for about three generations. Each time they are grown, the bulbs must be re-selected to remove any undesirable characteristics and concentrate the genes of the desirable characteristics." "Dr. Henry Jones (USDA) and Dr. Bruce Perry (Texas Agricultural Experiment Station in Crystal City, Texas) selected, developed and released Excel (986) from Yellow Bermuda and Eclipse (l 303), a white onion from Crystal Wax. They also found A and B lines in each of these lines giving us sets of both yellow and white lines for making hybrids. They developed a yellow pollinator C line, Texas Early Grano 951 (TEG-951) from Texas Early Grano 502. TEG-951 was selected for its extreme depth so that when crossed with the flat A line from Excel, it would produce a deep semi-globe Hybrid Granex. The pollinator for White Granex was developed from White Grano. 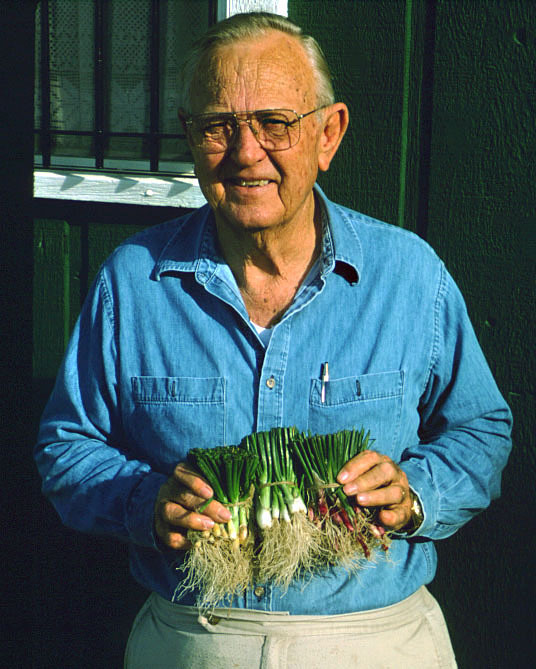 "I (Paul Leeper) started working with Jones and Perry on onion and spinach hybrids in 1952. During this period all selections and hybrid combinations were grown in a pink root infected seedbed block on the Norman Clark farm near Laredo, Texas. Plants were pulled, counted, bundled and transplanted in test blocks in the Crystal City and Weslaco Experiment Stations. Tests were also transplanted in Rio Grande City and Raymondville areas." "Seed for these tests were produced by Dr. Jones in Beltsville, Maryland, and in California in cooperation with seed companies. This cooperation with seed companies was important because they needed to learn the techniques for producing hybrid onions. Growing tests plots on growers farms here in the Valley was important in introducing the growers to the value of hybrid onions. The introduction of hybrid onions here in the Valley enabled us to move our production from dry land areas to irrigated areas because of the higher production of quality onions. Jones, Perry and Leeper worked as a team during most of the 1950's." "Jones left U.S.D.A. and went with Desert Seed Company in El Centro. Bruce Perry had a heart attack which limited his activity and was moved to the Horticulture Department at College Station with the closing of the Crystal City Experiment Station. From 1960 until about 1970, Leeper tested several hundred hybrid combinations produced by the various commercial seed companies for adaptation to the Rio Grande Valley of Texas. About three years prior to Dr. Leonard Pike's arrival, Leeper started a breeding program with Dr. Clint Peterson (USDA). 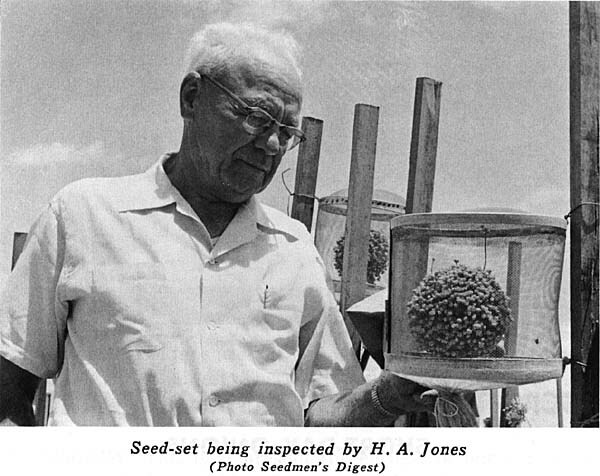 During this time period, seed of the A, B, and C lines of Granex and the A, B, and C lines of White Granex were supplied to Paul Leeper by Dr. Henry Jones of Desert Seed Company." "When Leonard Pike and Paul Leeper started their program, it was decided to start selections from open pollinated lines and to make a few crosses and select material for the development of new open pollinated varieties. This decision was based on the fact that after all the work on hybrids, THE MOST PRODUCTIVE ONION GROWN IN TEXAS WAS STILL TEXAS EARLY GRANO 502. There were earlier hybrids and different colored hybrids but the most productive was Texas Early Grano 502." "The pink root screening block was developed at the Weslaco Station so that Leeper and Pike could develop pink root resistance in their new varieties. Texas Early Grano 951 was grown in this plot and selected for resistance to pink root for several years in the development of Texas Grano 1015Y. Texas Grano 1020Y, Texas Grano 1025Y, Texas Grano 1030Y, Texas Grano 1105Y and Texas Grano 438 also were screened and selections made from the pink root block. 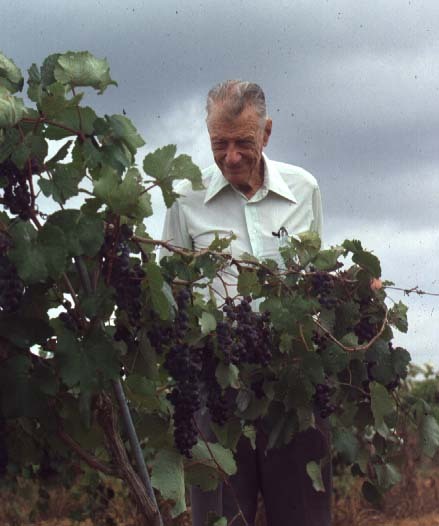 Texas Grano 438 and several other varieties were released by Dr. Leonard Pike about the time Paul Leeper retired." "The South Texas Onion Growers Association should be given much credit. They supported Paul Leeper's work before Dr. Pike through the Texas Citrus and Vegetable Growers Association". When Dr. Leonard Pike, a plant breeder from Michigan State, came to Texas, Othal Brand, Abe Katz and Otto Strubby put up the original money to support the program. The group later got a USDA marketing order approved to support the onion program. Onion crosses were made and trialed in Uvalde, Pecos, Presidio, El Paso, Fort Stockton, Las Cruces, Lubbock, Hereford, Munday, College Station and various other places with the assistance of many people including Sam Cotner (Wintergarden), Roland Roberts (High Plains), Tom Longbrake (Rio Grande Valley), Frank Dainello (Wintergarden - Uvalde), Bill Lipe High Plains - Lubbock), David Bender (High Plains - Lubbock), Bill Kingston and numerous growers all over Texas and in New Mexico. Dr. Pike crossed the onion variety Ben Shemen with the famous Texas Grano 502 in hopes of increasing the storage ability of the sweet Texas Grano 502. Releases (1020Y, 1025Y, 1030Y, 1105Y) were made with the Texas Grano 1015Y but because the four other varieties mature later than Texas Grano 502 and are more pungent than 1015Y, they have been grown less than the straight-line selection (1015Y) from Texas Early Grano 951 which is an inbred from Texas Early Grano 502 (4) without genetic crosses. Texas Grano 1020Y - (Tested as 434) A yellow Grano type originating from a cross between Texas Grano 502 x Ben Shemen. The variety looks similar to Texas Grano 502 but matures generally 5 to 7 days later. The bulbs are more round in shape and have more protective scales. It possesses good pink root disease resistance and storage qualities. It has a mild flavor, similar to Texas Early Grano 502. Texas Grano 1025Y - (Tested as 036) A yellow Grano type with a bright fresh appearance even after storage. It originated from a cross between Texas Grano 502 x Ben Shemen. The variety is almost round in shape, making it ideal for mechanized harvest and handling. It matures generally 10 to 15 days later than Grano 502. It produces large uniform bulbs and possesses good pink root disease resistance and storage qualities. It has been excellent for producing single center bulbs. Texas Grano 1030Y - (Tested as 433) A yellow Grano type originating from a Grano 502 x Ben Shemen cross. It has a bright yellow color, and the bulbs are a flattened globe shape. It has excellent resistance to pink root disease and the best storage and shipping qualities of any of the new varieties. It has a good scale retention, and should be a good export onion. The bulbs will grow large if given space, and they generally mature 2 to 3 weeks later than Grano 502. Texas Grano 1105Y - (Tested as 442) A yellow Grano type originating from a Grano 502 x Ben Shemen cross. It has a bright yellow appearance and the bulbs are a flattened globe shape approaching round, except when planted late. It has good resistance to pink root disease and storage quality. It has good scale retention and produces large bulbs if given space to grow. If planted as recommended, it will produce size and mature 3 weeks later than Texas Grano 502. The storage-shipping quality ratings were determined for the new varieties from onion bulbs stored in 50 lb. bags, with 25 bags per pallet or bulk in slotted wooden pallet boxes (40" x 42" x 42" in size) , under normal South Texas weather conditions during April through July. Pallets and slotted boxes were stored, under a shed with fans circulating the air through the onions. 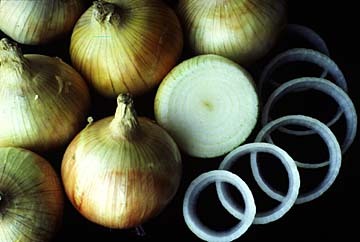 The short storage life of the existing short-day onion varieties is brought about by rots caused by Pyrenochaeta terrestria, Erwinia carotovora, Pseudomonas cepacia, Pseudomonas alliicola, Sclerotium rolfsii, and Fusarium species. On commercial bulbs which do not rot, considerable shrinkage occurs and is followed by severe black mold, (Aspergillus niger). On pink root infected land, the new varieties yielded up to 800 bags of onions when other breeding lines and commercial varieties of TE Grano 502, Ringer, and New Mexico Yellow Grano yielded 200 or less bags. On land where pink root disease was not a problem, yields were comparable to commercial varieties. Yields of 1430, 50 pound bags have been observed in one acre test plots, indicating the potential of high yielding capability for the new varieties. 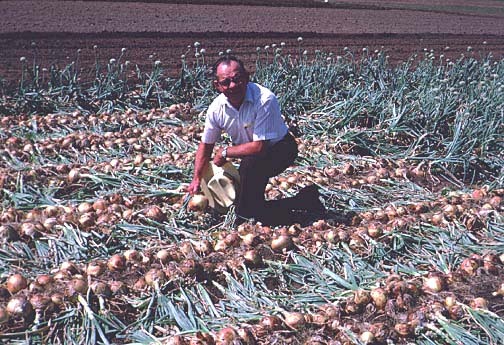 After the retirement of Paul Leeper, Dr. Pike continued the initiative for the onion breeding program in Texas. His emphasis is on genetic improvement of onions with high levels of naturally occurring chemicals providing health benefits in our diet. Texans have the opportunity of enjoying the best onion varieties - - bred and grown in Texas - - in the world. Wouldn't the Mother 'Grano 502' be proud!! 1. Hawthorn, L. R. Texas Grano Onion. Texas Ag Exp. Sta. PR 899. 1944. 2. Jones, H. A. and B. A. Perry. 1951. Hybrid may cause boom in new silver and gold onion. Southern Seedsman 14(9):21, 61, 67. 3. S. Jones, H. A., B. A. Perry and P. W. Leeper. 1956. White Granex. Southern Seedsman 19 (10): 20-21.